While Mongolia’s version is lacking the twang, blond bombshells, and sold out stadium concerts, country music in the Land of the Blue Sky does have a few things in common with its American namesake. For one, there’s a strong sense of national pride associated with both. Stateside, songs like Lee Greenwood’s ‘Proud to be an American’ and Toby Keith’s ‘Courtesy of The Red, White and Blue’ are full of pro-American rhetoric. Granted, the American patriotism in these songs tends to be a bit more aggressive than its mountain-praising Mongolian counterpart. Still, Mongolian country music is full of patriotic anthems. Javkhlan is one notable singer known for praising his homeland. He’s respected by many for being extremely pro-Mongolian. Although, as far as I can tell, his love for his country is more of the praising Mongolia and less of the threatening foreigners brand. Javkhlan is so committed to Mongolia, in fact, that he is purportedly running for office in next month’s parliamentary elections. Another similarity is the fan base. In both Mongolia and the United States country music is aptly named to represent the people who consume it as much as the people who create it. Here in Mongolia, country music is most popular among those who live outside of Ulaanbaatar (about half of the population) and those who recently moved to Ulaanbaatar. In the United States, country music fans tend to be from rural areas or states that have a larger proportion of rural citizens. Appearance is important in both genres as well. Musicians try to look like an aggrandized version of a folk hero. In America that means denim, cowboy hats, boots, and big muscles (for men, that is). In Mongolia, that means deels (the traditional dress), Mongolian hats, boots, and big muscles. 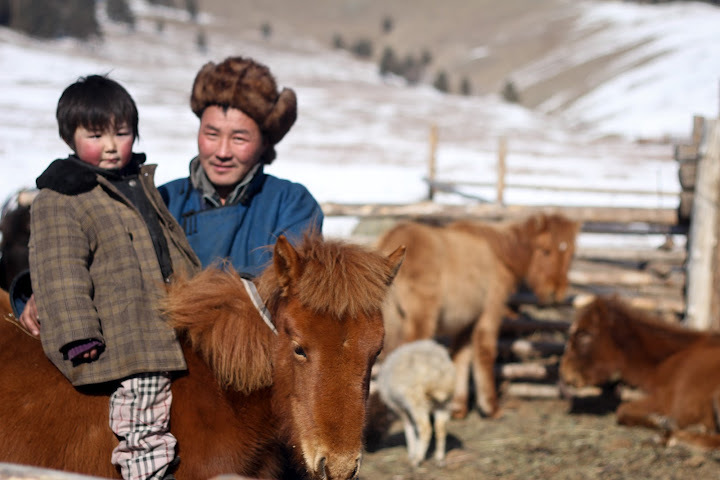 Music videos often rely on visuals of horses, hard work, connection to the land, overt national symbolism, and images that reinforce an idea of traditional life (a white-picket fence in America vs a white-felted ger in Mongolia). Finally, both styles are musically accessible. American country music is full of those good old predictable G-C-D chords that anyone first learning to play the guitar knows. Songs are easy to sing along to and are familiar even to those Americans who don’t actively listen to country music. Similarly, Mongolian country songs are all written in the pentatonic scale – the five note scale used in traditional Mongolian music. It’s easy for Mongolians to hear country music without having much musical knowledge themselves. Mongolian country songs tend to be well known, even by those who openly admit to disliking the genre. One of the places the two country music traditions part, however, is overall popularity. Even in Ulaanbaatar, roughly 70% of the radio play is dedicated to country music. There are generally more live* country music events than any other genre (save, perhaps, classical). Seven times out of ten my taxi driver will be listening to country songs on the radio or on a CD – sometimes singing along. While this might be the case for country music in certain regions of the United States – in massive population centers like New York City, Los Angeles, or Chicago, it is certainly not getting the majority of airtime. I’ll admit, I’ve been hesitant to look into country music too much. I think my aversion stems from the fact that all of the backing instruments are created via computer creating a hollow sound that I find difficult to listen to for long. But, it is a significant percentage of the music currently being produced in Mongolia, and a huge portion of the market. I’m hoping to look a little deeper into the scene in the coming weeks, and will hopefully have a more nuanced update. *The backing tracks for Mongolian country music are almost exclusively done on computerized midi files, which means a live music event is a singer accompanied by one of these recordings. 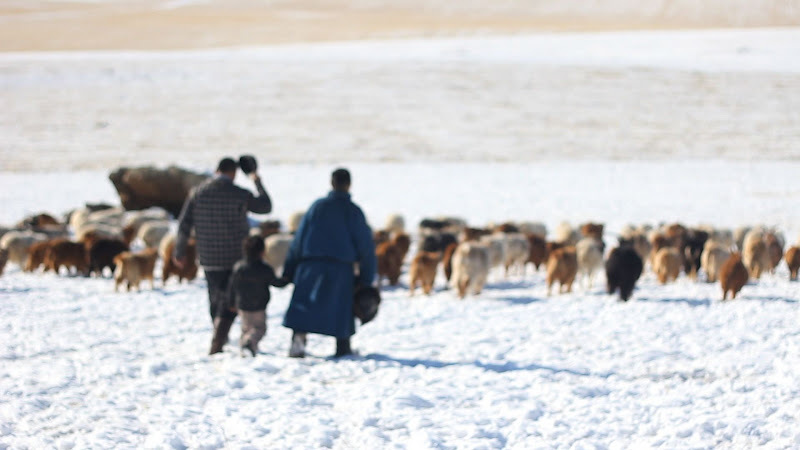 Last February, I spent a day with some herders just 2 hours outside of Ulaanbaatar. I was accompanying a friend of mine and her aunt as they went to buy two fresh sheep for the upcoming Tsagaan Sar celebration. We arrived at the first family’s ger (home) around 10:00 am. They served us milk tea and some freshly made buuz. Then the husband and wife and their young son hopped in my friend’s small Toyota and we headed off to another herder family’s home about 10 km away. We were lucky to be on a paved road for about half of the way, but relied on the little hatchback to do her best as we off-roaded it over the snowy terrain to the second ger. 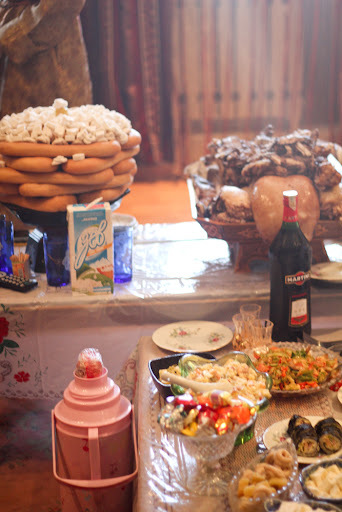 Upon arrival, we were again greeted and served milk tea, a standard sign of Mongolian hospitality. 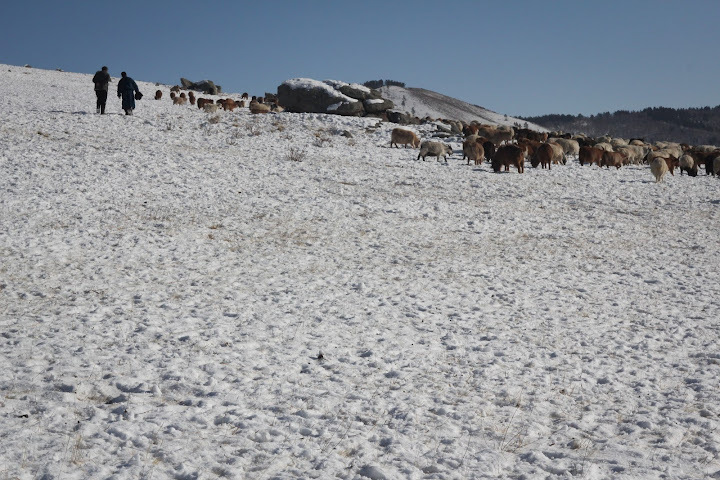 With the horses gone off to get water, we had to drive the Toyota through the snow to where the sheep were grazing – another several kilometers away. I’ve never seen the herding process before, and I didn’t really know what to expect. Perhaps it might be different if the men were on horseback, but I was surprised at just how time intensive and exhausting it was to round up so many sheep. I was also surprised to see the method of catching the sheep: basically spotting the one you want, running into the herd, and tackling it. It’s quite entertaining to observe. Over the course of the next hour, the two herders caught four or five sheep. They would compare their legs and tails to judge which one would be the best for eating at such a high holiday. They were very concerned with finding the two best sheep, which, to be honest, all looked the same to me. After they chose the two winners, they tied them up, and lobbed them into the trunk of my friend’s hatchback, and we returned to the ger. 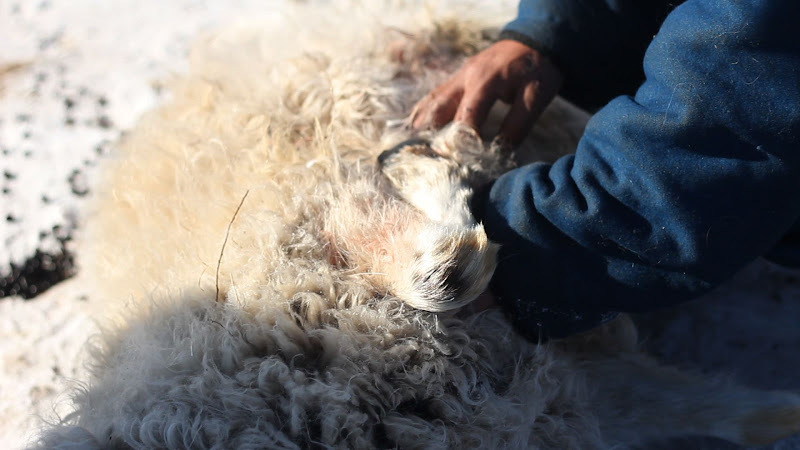 The next 4 hours were spent killing, skinning, and cleaning the sheep – not for the faint of heart. 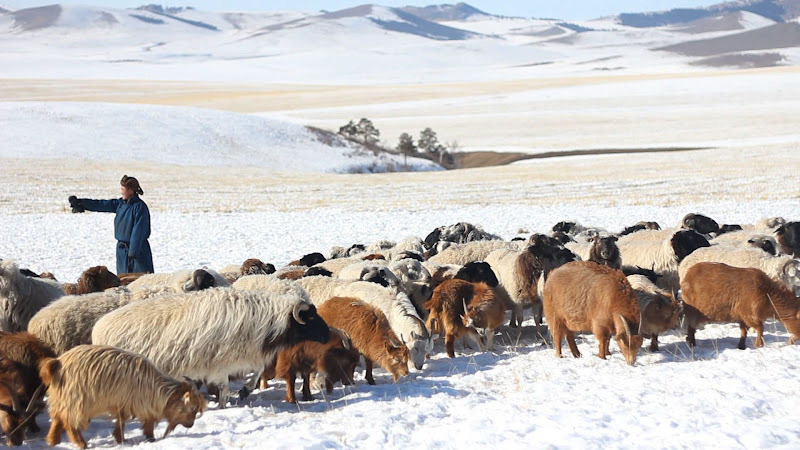 The traditional Mongolian method for killing sheep might be surprising. 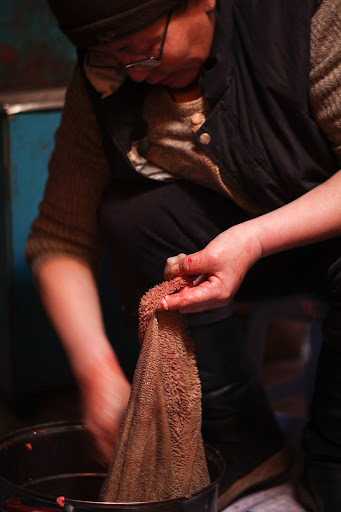 They cut the sheep’s belly lengthwise, stick their hand into the chest cavity and stop the heart by pinching the aorta. It takes no more than 5 minutes and the sheep don’t make a sound. 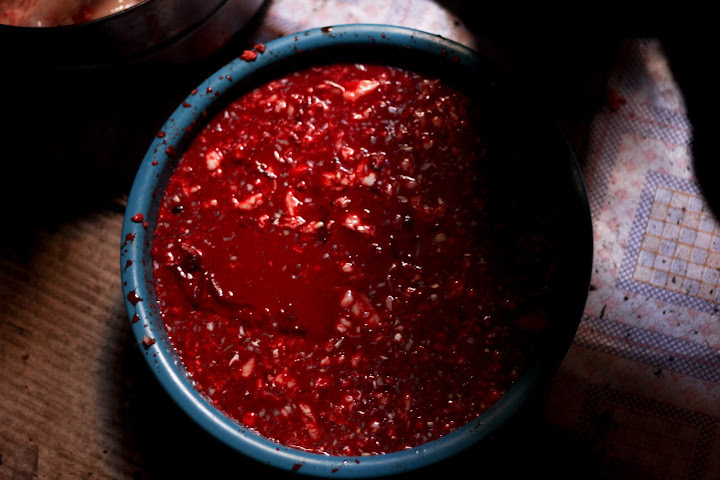 After, the two herders each skinned one sheep – ripping the skin from the fat and muscle. 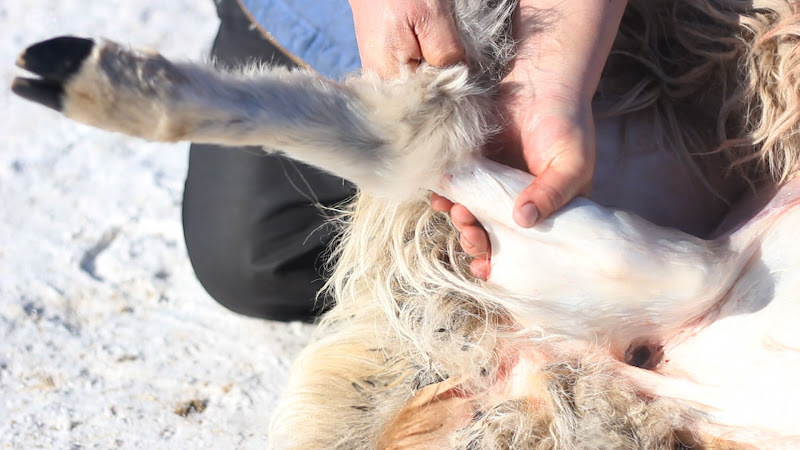 The pair made the skinning process look rather easy – using the fat to grease their hands and separating the skin from the muscle. The young boy climbed all over his father as he was exerting himself, but he didn’t seem to mind much. After about 15 minutes, the sheep were fully skinned. They would sell the pelts and feet later. rgans. First they cleaned the small and large intestines, squeezing out feces and running water through them until they were clear. 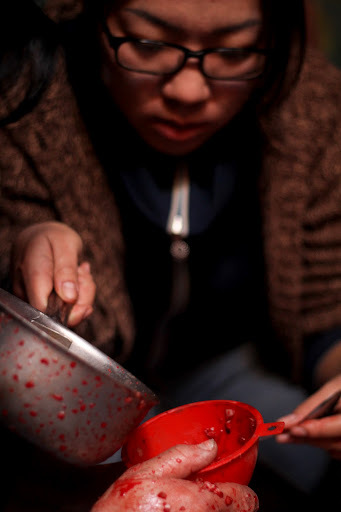 Then they mixed blood with onion and garlic, which they poured into the intestines. This would later be cooked to make a tasty sausage-like treat. After all the organs and intestines were properly cleaned, they stuffed them into the sheep’s stomach. They stretchy tissue served as an extremely efficient sack. 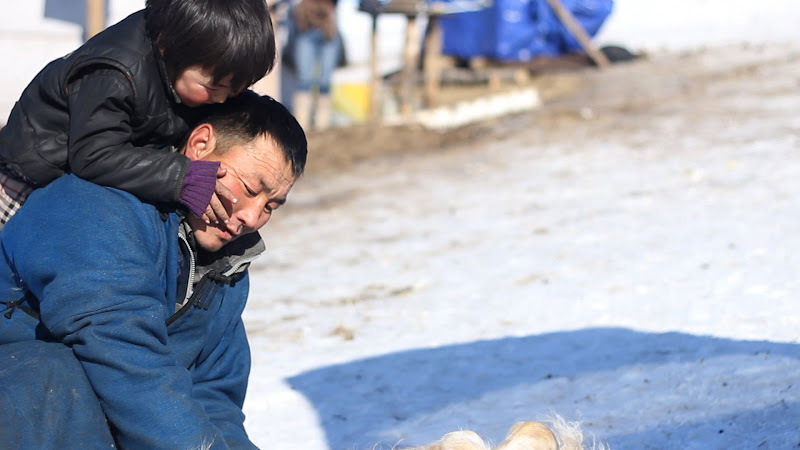 Coming from the United States, where the commercial slaughtering process is less than ideal, it was refreshing to observe how intimate the herders are with their livestock. Not part of the animal was wasted – nothing is taken for granted. 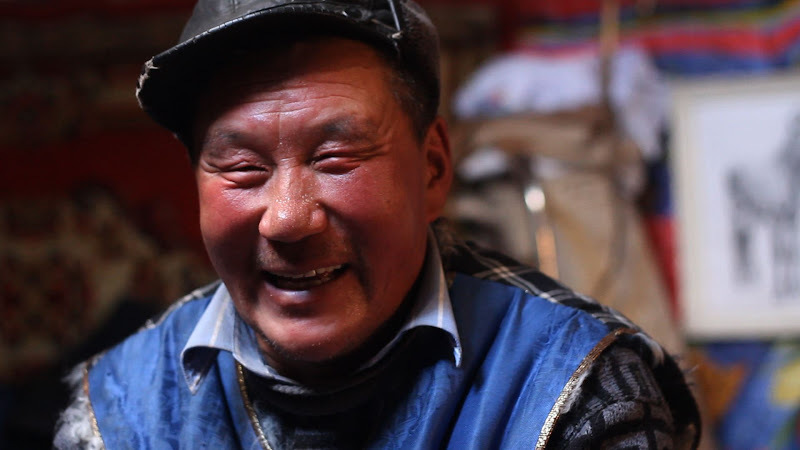 After all was said and done, I sat down with Batbayar, the older and more experienced of the two herders. He was extremely proud of his profession, saying that there was nothing difficult about it at all. ‘With the fresh air in the countryside, herding is a really nice lifestyle,’ he told me. 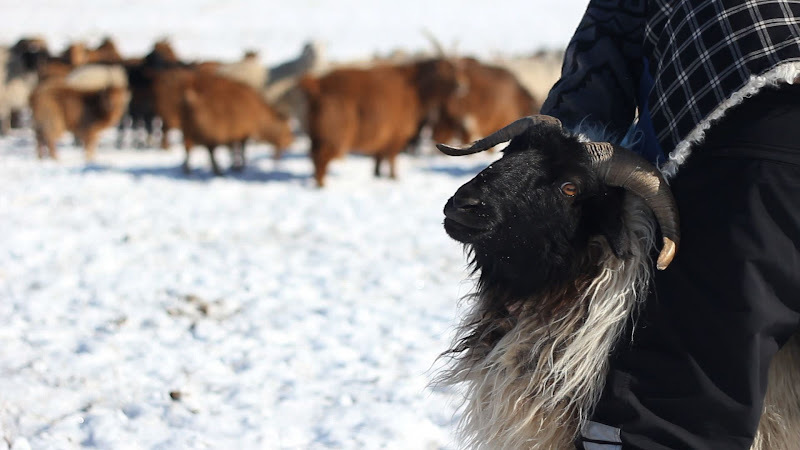 Batbayar comes from a long line of herders out west in Zavkhan Province. 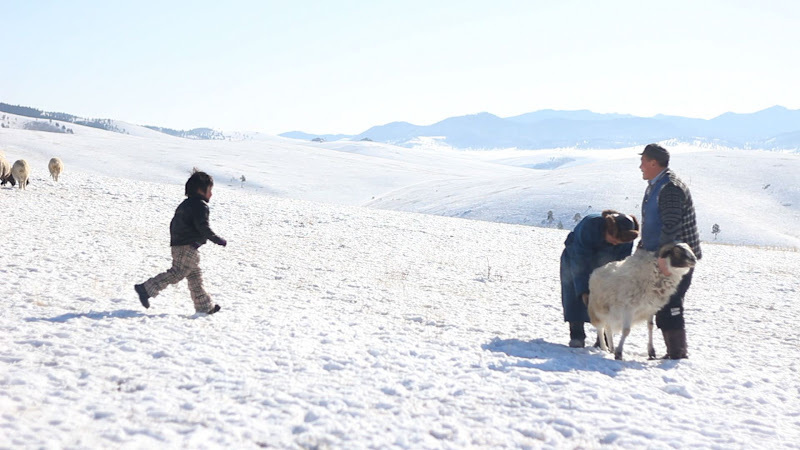 He moved to this region just outside of Ulaanbaatar with his family and 400 goats and sheep just 5 years ago. 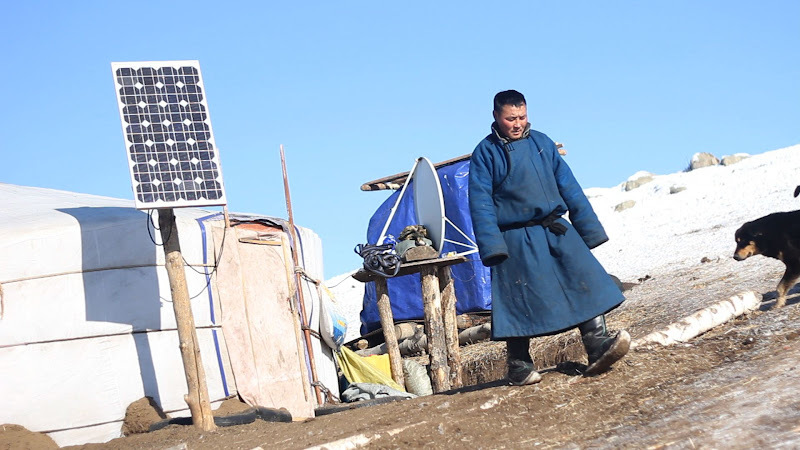 Batbayar told me that his family was quite busy recently, selling and preparing sheep for out-of-town customers almost everyday ahead of Tsagaan Sar. He said his daily life is simple: wake up, take the herds out to pasture, look after them as they graze, and bring them home in the evening. There are additional chores like tending to the cows and cleaning out the pens. But, for the most part it’s the same everyday. “We never change our work, we just have one job,” he explained. The herders will sell the ankle bones of the sheep for pieces in a popular game similar to jacks or dice.